I got my spiralizer probably about 8 years ago from Amazon (trendsetter, I know!). It was made by Paderno and they seem to have a new and improved model with more blades/noodle options, woo! When everything bakes together it turns into this surprising, satisfying, spicy, creamy, casserole-ish beauty. The sweetness from the sweet potatoes pairs perrrfectly with the spicy buffalo sauce (I used Frank's Red Hot, because what else would I use?)! It's also dairy free and Whole30 if that's your jam! If not, you'll still love it, I swear. I used the "thick" noodle blade for my spiralizer since I knew this would be in the oven for a while, but I think thin would have worked just as well! It makes two 9x13 pans, so you could bake both and freeze one for later (see freezer instructions at the bottom of the recipe)! Or combine them both into one pan once they are done and eat it all week (like we did)! Don't be alarmed - some liquid will pool in the bottom of the casserole dish as this cooks; but once you toss it all together, that's what helps form the "sauce." The almond flour and eggs help with this too! If you don't have a spiralizer, you could use grated or chopped sweet potatoes. I used chicken thighs because they are delish, but you could definitely sub chicken breast if you want. Grease two 9x13 pans with cooking spray, coconut oil, or ghee and preheat oven to 400 degrees Fahrenheit. Scrub sweet potatoes clean and cut off the ends, then use a spiralizer to cut the sweet potatoes into noodles (I used my "thicker" noodle blade), then split them between the two baking dishes, pressing them down into the bottom of the pans. TIP: I don't peel them, but you can if you want to! Dice the peppers and onions and add them to a large bowl. Cut the chicken thighs into bite-sized pieces and add to the bowl as well. Move that stuff to the side to make a little hole against the side of the bowl and crack all 4 eggs in there, then add the Frank's Red Hot and ranch dressing. Use a fork to whisk the eggs and sauces together before combining it all together. Optional - sprinkle in 3/4 cup of almond flour. TBD whether this is totally necessary, but I thought it might help to balance out some of the liquid that will cook out of the chicken and veggies! 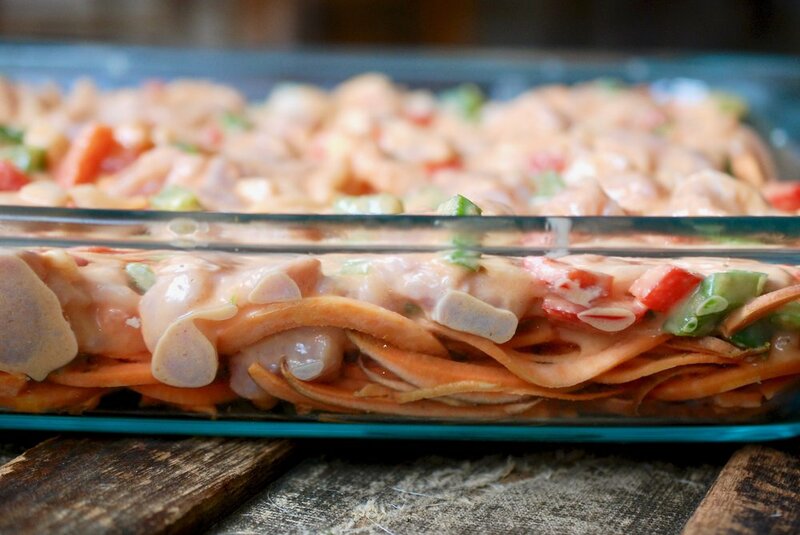 After everything is combined, use a measuring cup to portion out the chicken mixture over the sweet potato noodles. Bake for 45 minutes to an hour or until the sweet potato noodles are cooked through. Use tongs to toss the mixture together, distributing the sauce and sopping up the liquid that has probably gathered at the bottom of the pan. Turn oven to broil and continue to cook for 5-10 minutes (tossing half way through if needed. Keep an eye on it so the swoodles don't burn!). Drizzle with extra Red Hot and ranch, top with green onions (not optional!) and dig in! Allow the pans to cool completely, then top with a layer of saran wrap and a layer of heavy duty aluminum foil, sealing the edges. Chill in the refrigerator for a few hours or overnight. Mark with the date and recipe name and freeze. Allow the "pasta bake" to thaw overnight in the refrigerator (2 days if you can manage). Reheat slices in the microwave OR reheat the whole pan in a 300 degree oven for 45 minutes or until heated through.